Have you ever noticed how folk songs, those ancient ballads embedded in the very fiber of our beings, can stir such deep emotion? Greensleeves is one for those of us of European descent. It’s had many iterations (What Child Is This? is but one) over the centuries, but it’s melody resonates with us. English composer, Ralph Vaughn Williams collected folk music and songs, many of which were worked into hymn tunes. Many of these folk songs were known by different names, depending on the region. One of my absolute favorites is Five Variants of Dives and Lazarus. I’m including it at the end of my post. I’m not exactly sure how the melody relates to the parable of Dives and Lazarus from Luke’s gospel, but I suspect it’s because the words of the folk song told the story. I much prefer to orchestral version anyway. Don’t you love a great story? I don’t think we ever get too old for stories and I still nag my poor husband every night for a bedtime story. Jesus was a great story teller. He knew the best way to engage his audience was through a good story. He’d start the story, grabbing their attention. They’d be settled in, all wrapped up in the story and he’d zing them with the truth of his message before they knew what hit them. Most unnerving, but very effective. The parable of Dives and Lazarus is one of those stories. Dives was not one of the guy’s name. It’s Latin for very rich or splendid. Maybe you’re more familiar with the title The Rich Man and Lazarus. Also, this isn’t the same Lazarus that is reported to have been raised from the dead by Jesus in another gospel. The religious leaders (aka the Pharisees) were standing on the outer margins listening to Jesus teaching his followers. The topic of the day was money, which happened to be a favorite subject of these religious leaders. Of course, their ideas about money and Jesus’ ideas about money were quite different. So Jesus tells them a story to make his point. ‘There was a rich man who was dressed in purple and fine linen and who feasted sumptuously every day. And at his gate lay a poor man named Lazarus, covered with sores, who longed to satisfy his hunger with what fell from the rich man’s table; even the dogs would come and lick his sores. The poor man died and was carried away by the angels to be with Abraham. The rich man also died and was buried. In Hades, where he was being tormented, he looked up and saw Abraham far away with Lazarus by his side. 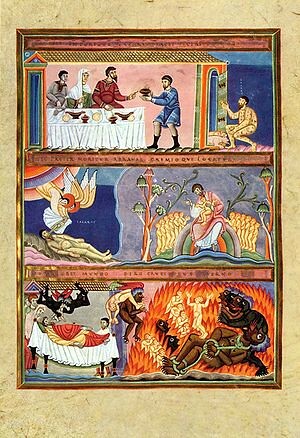 He called out, “Father Abraham, have mercy on me, and send Lazarus to dip the tip of his finger in water and cool my tongue; for I am in agony in these flames.” But Abraham said, “Child, remember that during your lifetime you received your good things, and Lazarus in like manner evil things; but now he is comforted here, and you are in agony. Besides all this, between you and us a great chasm has been fixed, so that those who might want to pass from here to you cannot do so, and no one can cross from there to us.” He said, “Then, father, I beg you to send him to my father’s house— for I have five brothers—that he may warn them, so that they will not also come into this place of torment.” Abraham replied, “They have Moses and the prophets; they should listen to them.” He said, “No, father Abraham; but if someone goes to them from the dead, they will repent.” He said to him, “If they do not listen to Moses and the prophets, neither will they be convinced even if someone rises from the dead” ’ (Luke 16:19-31). Understanding a parable is no different than understanding a good story. The key is to take it as the story it is, not reading stuff into it that was never intended. Now, sometimes knowing a little about the historical-cultural context can helps us understand why Jesus used the images he did, but we have those same issues when we tell stories today. If I tell a story referencing something that’s going on in my American life, my friend in Nepal may not know exactly what that reference is, but she’ll still be able to get the idea of my story because those details don’t change the point of the story. So, what do you think the point of this story is? Bingo! Wealth, without concern for the poor, is a great wickedness. If we close our eyes to the truth we are given, we’re doomed. Unless we’re open to the truth, nothing will ever convince us of it. That was exactly the point Jesus was making to the religious leaders of the day. They paraded around acting holier than thou, with all sorts of laws set up to righteously distance themselves from those less desirable. They so rigidly constructed their understanding of their religious doctrines, they had a pat answer for everything and everyone. They weren’t open to anything else (sound familiar with certain religious types?). Most good stories challenge us. We think about it and wonder what meaning it may have for our own lives. You probably already know where I’m going with this. What can you learn for yourself from this story?